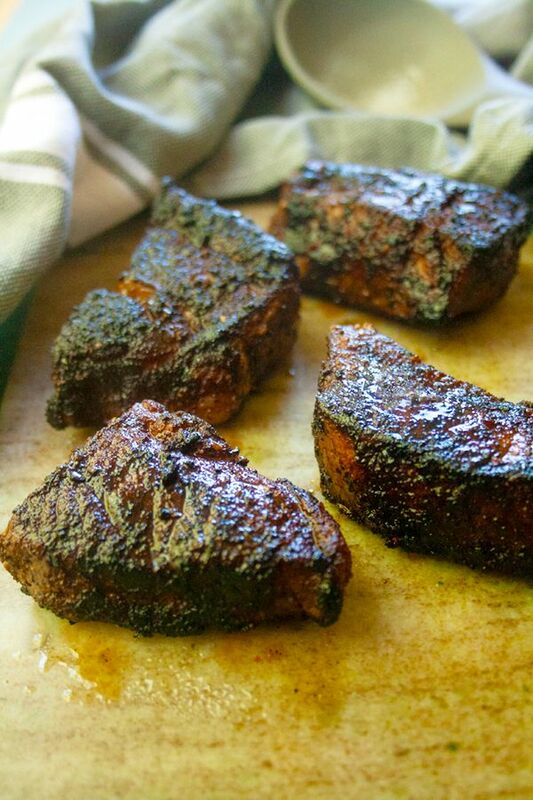 This Cocoa Rubbed Steak with Chimichurri is perfectly crusted in a chocolate-y steak spice rub. 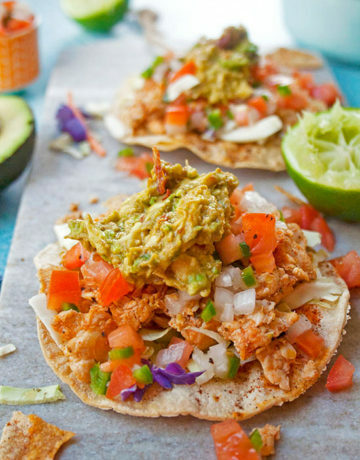 It’s crunchy on the outside, juicy on the inside and cooks in less than 20 minutes! So now that Tim and I are at the age where we’re considered “real adults”, we’ve been trying to budget, eat better and move more. We’d been really unsuccessful for a long time because a day of cubicle work didn’t exactly inspire us to be healthier…just us? As part of our be better initiative, we’ve significantly cut back on our favorite hobby, EATING OUT. What that’s meant is we have more home cooked meals and less delivery. 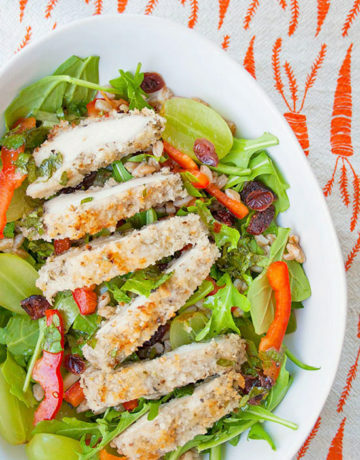 To kick our habit, I cook some decadent and indulgent weeknight meals that have far less calories than restaurant meals. Our new Friday night favorites are Chipotle Turkey Burgers and this Cocoa Rubbed Steak with Chimichurri. I know we’ve been told that cream and butter makes everything better. And in a lot of cases that’s true BUT they’re not strictly needed for a lot of meals. For this cocoa rubbed steak, olive oil replaces butter and the steak spice rub really pack a punch of flavor. 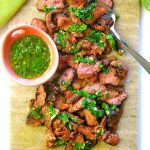 You won’t miss the the rich and creamy steak sauces that you get in steakhouses because the chimichurri on here is so fresh and garlicky and DELICIOUS! Also if you’re new to making healthy swaps or substitutions in your recipes, check out this handy guide, How to Make Healthy Food Swaps That Actually Taste Good! 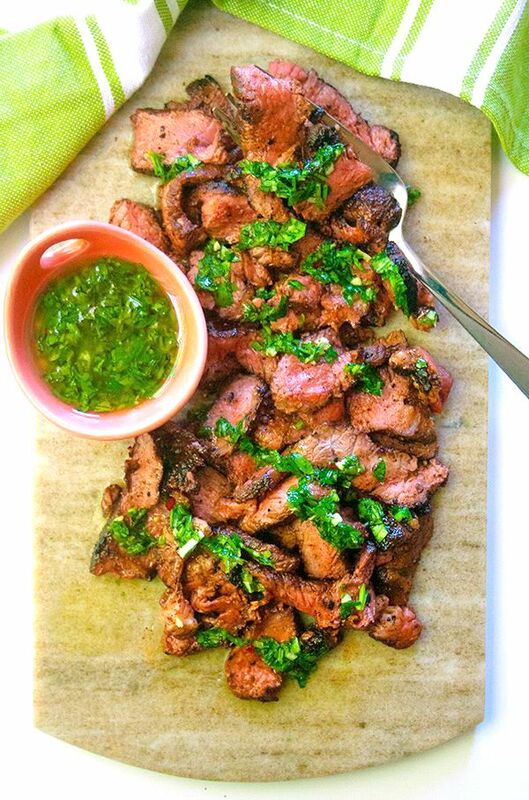 * For those of you who are uninitiated with chimichurri, get ready for a life changer! 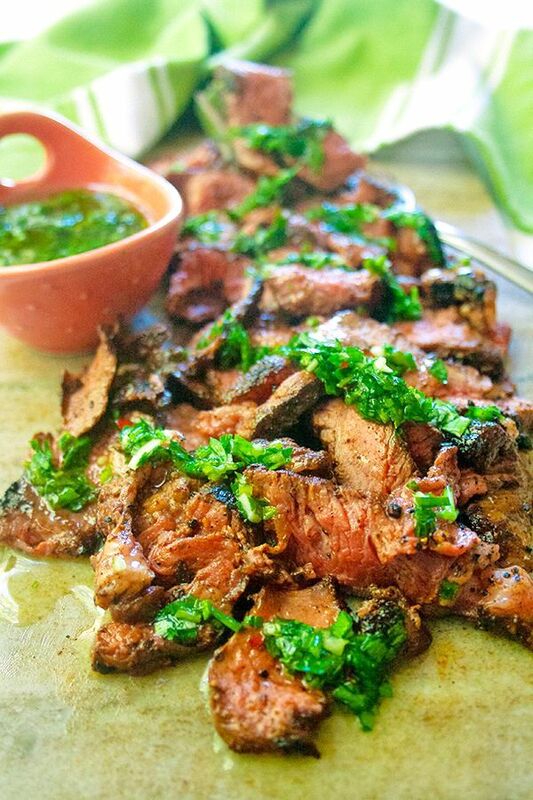 Chimichurri is an Argentinian sauce primarily used on grilled meats; the prominent flavors are garlic, parsley and vinegar. BTW it tastes good on roasted veggies too if you don’t eat red meat. I remember being so scared to make it from scratch for this cocoa rubbed steak because it seemed like a challenge to get it just right. Little did I know it’s just a a few ingredients that are whisked up in 2 minutes flat. One thing I love about a great steak is the crispy crust. My mom stopped eating pork and red meat when I was a pre-teen, so I didn’t eat or cook a lot of red meat at home. This of course led to me having some real anxiety when it came to cooking steak (ask Tim…the nerves are serious!). For a long time, I didn’t know how to get a great crust or check for done-ness but it was all trial and error. I don’t want you to struggle like I did. 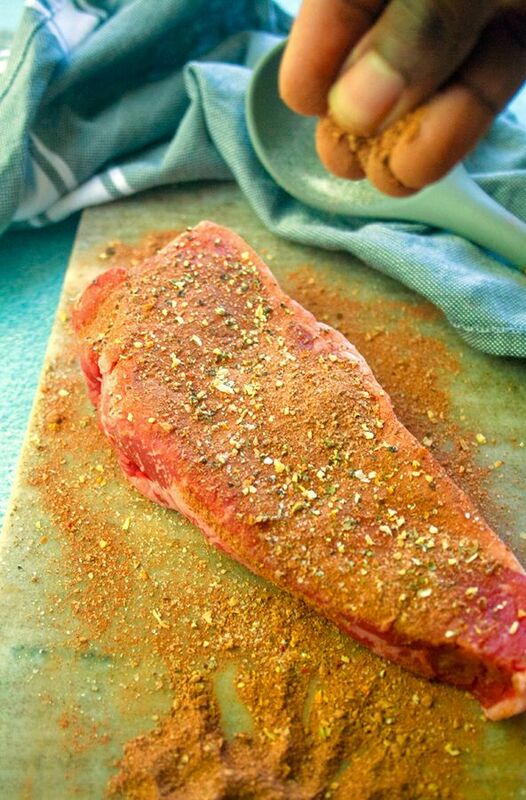 Below are my tips for using this steak spice rub to get the best crust on this steak. For done-ness cooking tips I recommend this super helpful video from the American Heart Association. When you put room temperature red meat into a pan, it will create steam and boil the steak instead of creating a pretty crust….that’s NO GOOD. To avoid boiled steak, make sure to pull the steak out of the fridge right before you’re ready to cook it. As with the cold meat, a pan that isn’t pre-heated enough, will create steam rather than a crust. Be sure to heat your skillet to medium-high heat for 3-5 minutes before adding oil or the steak to it. To check if your pan is hot, hover your palm in the middle of the pan (avoid touching the actual pan). You should feel warmth rising on to it. If it still feels cold, give it another minute or so to warm up. This is a trick I learned from Food Network years ago (sorry don’t remember what show it was). You’ll need to pat dry the steak with paper towels on both sides to remove all additional moisture. Once the steak is dry, then you can coat it with the steak rub. Ready to be a steak cooking whiz? 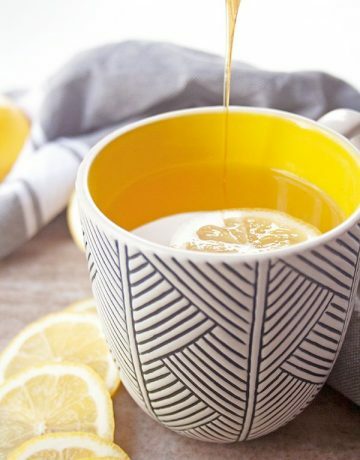 Try this recipe out and let me know what you think in the comments below! Mix together all the dry spices and cocoa powder in a small bowl. Pat dry the steak with paper towels to remove residual moisture. Press each side of the steak into the cocoa spice rub. Tip: I like to cut the steak into 3-4 evenly sized chunks so that they cook faster than a whole steak. Heat skillet to medium-high heat. Once the pan is hot, add 1 tsp of olive oil to it. Add steak to the hot pan and cook 3-5 minutes per side. Depending on how you like steak cooked, it may take longer. Refer to the blog post for the done-ness video guide. Once cooked to your liking, remove it from the pan and let the steak sit for at least 5 minutes before slicing (against the grain). In a small bowl, whisk together all of the chimichurri ingredients. Drizzle over sliced steak. Enjoy!